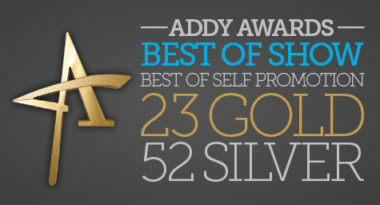 MDG takes home more awards than any other agency for fourth consecutive year. BOCA RATON, Fla., March 12, 2013 /PRNewswire/ — MDG Advertising took the spotlight at the recent 2013 American Advertising Federation of Greater Fort Lauderdale ADDY® Awards. MDG won the prestigious Best of Show award and the Best of Advertising Self-Promotion award, along with 23 gold ADDYs and 52 silvers, earning more awards than any other agency for the fourth consecutive year. “It’s an incredible honor to receive such an abundance of accolades year after year, and it’s a testament to the enormous talent of our team. We’re fortunate to work so well together and have such strong relationships with our clients,” says Michael Del Gigante, MDG’s president/executive creative director. MDG won honors in nearly every category for its work for Dental Care Alliance, The Breakers Palm Beach, TooJay’s Gourmet Deli, Vetstreet, HMF, Lumbermen’s Insurance, Primary Pharmaceuticals, HCA East Florida Division, Achievement Centers for Children and Families, West Palm Hospital, Lafayette Federal Credit Union, IBM Southeast Employees’ Federal Credit Union, Kiddie Academy, Round Hill Hotel and Villas, Carls Patio, MDVIP, Food Signals, Chihuahua Haus, and Boca Raton Museum of Art. The Best of Show award recognized direct mail created for Dental Care Alliance, while the Best of Advertising Self-Promotion award distinguished MDG’s video, “A Marketer’s Guide to Pinterest.” “It’s a privilege to create work that’s recognized by our peers, but it’s the effectiveness of our campaigns and the satisfaction of our clients that ultimately define MDG’s success,” said Del Gigante. MDG’s winners will advance to the American Advertising Federation’s District 4 regional competition, followed by the national competition. Founded in 1999, MDG Advertising has a leading reputation for developing targeted and integrated 360° marketing solutions. Clients benefiting from a competitive advantage developed by MDG include The Breakers Palm Beach, Dental Care Alliance, IBM Southeast Employees’ Federal Credit Union, The Seagate Hotel and Spa, Carls Patio, Brain Balance Achievement Centers, Primary Pharmaceuticals, South Florida Fair, MDVIP, Round Hill Hotel, TGI Office Automation, TooJay’s, Upfront Foods, Signature Consultants, World Fuel Services, Benetrends, Max Planck Florida Institute, and HCA East Florida.